Stars flood our night sky, enough to stagger even the most casual of stargazers. Still, telescopes are necessary to reveal just how numerous stars are in the Universe. One striking example of this phenomenon is globular clusters (GCs) which appear to the naked eye as a single bright point in the sky but are actually hundreds of thousands or millions of tightly bound stars (see figure 1). Today’s article is a letter that succinctly announces the discovery of three new globular clusters in the bulge of the Milky Way that may be nearly as old as the Universe. Fig. 1 – Left: a sky chart showing the location of M13. This globular cluster is one of the brightest and is barely visible with the naked eye (credit: earthsky.org). Right: M13 photographed by Hubble (credit: ESA/Hubble & NASA). Past Astrobites have discussed the formation of GCs. Two key features are that most GCs formed early in the Milky Way’s history during one of its bursts of star formation and that the countless stars formed nearly simultaneously. The latter fact allows us to accurately determine the age of most globular clusters. Since all stars in the cluster were born at the same time, and our models give excellent constraints on the lifetime of different stellar types, asking which stars are still alive in a cluster reveals its age. Given the sheer number of stars in a globular cluster, a typical GC is therefore a bright structure that can give insight into the some of the earliest chemical and cosmological history of the Milky Way. Beyond their utility in astronomy, globular clusters are also studied because they house exotic and unusual stellar types due to the large number of collisions and interactions between the tightly grouped stars. The three globular clusters (Camargo 1107, 1108, and 1109) discussed in the letter were characterized using four different surveys: data from the Wide-field Infrared Survey Explorer (WISE), the VISTA Variables in the Via Lactea (VVV) survey, the Two Micron All Sky Survey (2MASS), and Gaia-DR2. WISE provided the initial images of the clusters (Figure 2). Gaia photometry is necessary to recover the proper motions of the stars and VVV and 2MASS give the magnitude of stars in different bands. Fig. 2 – Images of the center of the globular clusters (left to right, Camargo 1107, 1108, and 1109) from WISE. Figure 1 in the paper. By considering the light received at three different infrared bands (J, H, and K) it’s possible to characterize the brightness versus color for the stars and construct a color-magnitude diagram (CMD). 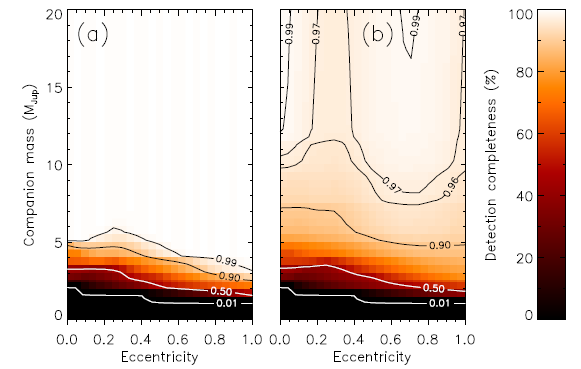 CMDs are useful because color is a useful proxy for temperature and a comparison between temperature and magnitude helps place a star in its evolutionary track (the most famous example of a CMD is the HR Diagram!). Since all the stars theoretically formed at the same time they should be connected by an isochrone, a line on a CMD marking stars of the same age. Past models have determined that different isochrones correspond to clusters of different ages and metallicity so the authors of today’s paper were able to extract the key parameters of the clusters by fitting isochrones to the CMDs. Fig. 3 – Color-magnitude diagrams for the three globular clusters. Color is quantified as the difference between two bands. Dark data points are stars from the clusters themselves, while pale dots are stars from similar clusters. The solid red lines are the fitted isochrones. Adapted from Figure 3 in the paper. The estimated ages of Camargo 1107, 1108, and 1109 are, respectively, 13.5 ± 2.0 billion years, 13.5 ± 1.5 billion years, and 12 ± 1.5 billion years. Modern estimates place the age of the Universe at ~13.8 billion years so even at their lower limits these clusters are incredibly old. Most heavy elements only formed after the Universe had existed for sufficient time for stars to reach the end of their lifetimes, so it makes sense that these clusters are extremely metal-poor. Camargo 1109, the youngest, only has about 3.2% of the metal content found in the Sun, Camargo 1108 has 1.6%, and Camargo 1107 has a mere 0.6%. Around 160 globular clusters have been discovered in the Milky Way. Astronomy frequently compensates for the scale of its history with large number statistics. The addition of even just three globular clusters is therefore a valuable addition to our catalog of snapshots of the early Universe. The authors point out these three globular clusters are useful discoveries not just for their age but also their location: they are potentially the source of ancient stars near the center of our galaxy. As astronomy moves further into the era of “big data” with surveys like the ones used here, further discoveries like these clusters will hopefully empower us to craft finer resolution histories of our Universe. Must have been a really old camera.